1. Mount the unit upright with a water loop in the cabling and away from vibration, weather and direct water damage (On a post and covered, if no other support is handy). Use the screws or silicon to mount the unit. Do not mount the unit upside down or allow it to swing around freely on its wiring. 2	Bolt the sensor firmly to the engine in a location that will reflect its working temperature, yet not exceed 125 deg. C. (avoid mounting the sensor near the exhaust manifold). Do not bend the wire at the sensor sharply. Starting at the sensor, place the spiral wrap provided around the sensor cable. Secure the lead allowing for movement. NOTE If using large cable ties, DO NOT over tighten them and crush the sensor cable. If the sensor hole needs enlarging carefully file it, do not use a large drill or squash the sensor barrel in a vice. 3. 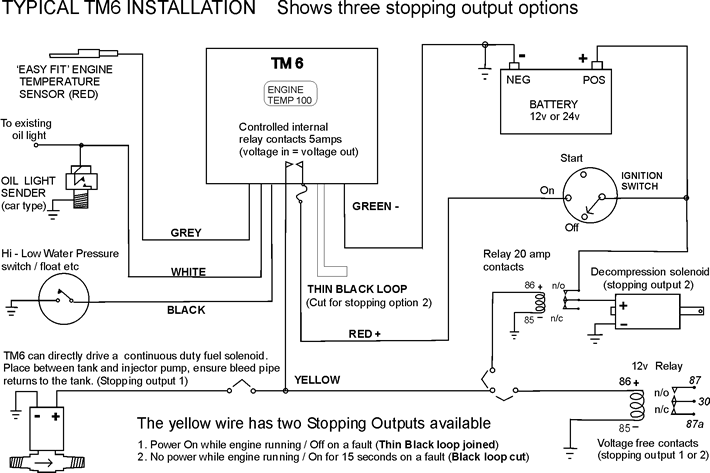 Wire as per the diagram after selecting the correct wiring and stopping method (see yellow wire option 1 or 2) Power wires are via the ignition switch. Oil pressure wire goes to an oil light sender (Not a pressure gauge sender). If the engine is not equipped with an oil light sender, discard this wire or fit a sender that uses normally closed contacts with no oil pressure (standard car type). 1. 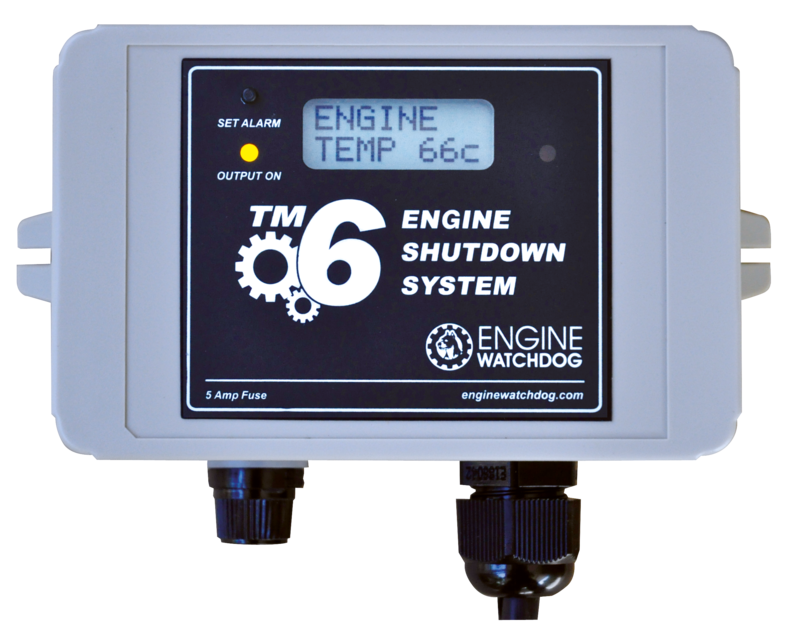 Run the engine up to working temperature and note the highest normal working temperature displayed on the TM6. 1. As soon as the TM6 starts, press the ‘Set Alarm’ switch down. The unit will display its normal reminder messages and then stall on Manual Bypass. Measure the amount of bypass time you require and then reset the automatic bypass time as per point 7 in the Operating Instructions. 1. To test the Stop Temperature - Set the stop temperature lower than the normal operating temperature. 2. To test the Oil Function – Ground the white wire and the unit will stop the engine. Note. Remember to set the temperature back to the original setting. Fault Finding – To fault find disconnect all wires except the red and green power wires and check each function individually. Fuel Solenoid will not stop engine - Ensure the engine stops when the yellow wire is pulled off the positive terminal of the solenoid. Fuel Solenoid is slow to stop the engine – Ensure the injector pump bleed pipe returns to the tank.